We are not helpless. We can change our world. We can assert our identity in the face of media spin and fake news. We can defend the biosphere. 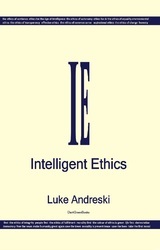 "Ethical Intelligence" by Luke Andreski shows you how to tackle propaganda and deceit. "Intelligent Ethics" shows an ethical pathway to social change and ecological renewal. Both books are available on Amazon now.